According to statistics, 2018 saw 1,287 murders, down sharply by almost 22% from the 1,641 murders observed in 2017. This number was even below that of 2016, but slightly ahead of 2015. Even with the reduced murder count, 2018’s murder rate of 47 per 100,000 inhabitants placed Jamaica among the most homicidal nations in the world, putting us in the same category as nations such as Lesotho, Venezuela and Honduras. On January 18, 2018 a State of Public Emergency was declared in St. James. 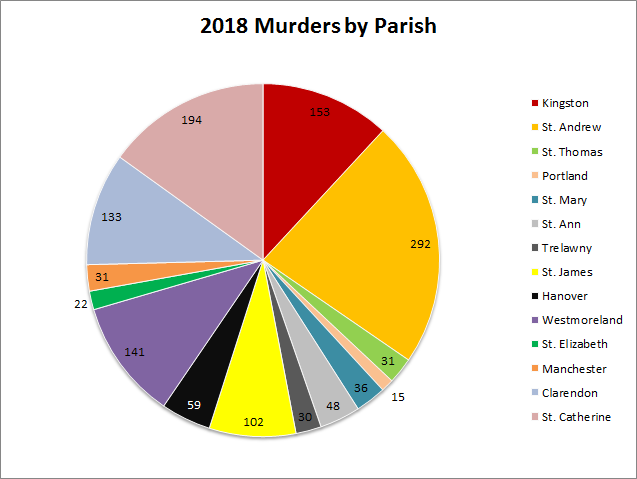 This was kept in effect for the duration of 2018, the result was a dramatic fall in murders in the parish from 2017. 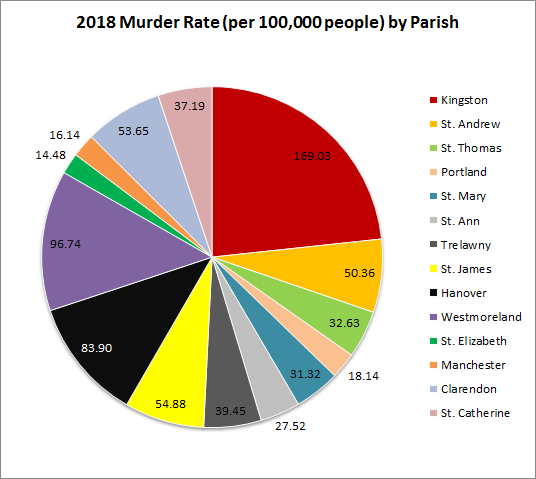 In terms of murders per 100,000 inhabitants (murder rate), St. James went from the second in 2017 (behind Kingston) to fourth in 2018 (behind Kingston, Westmoreland and Hanover). 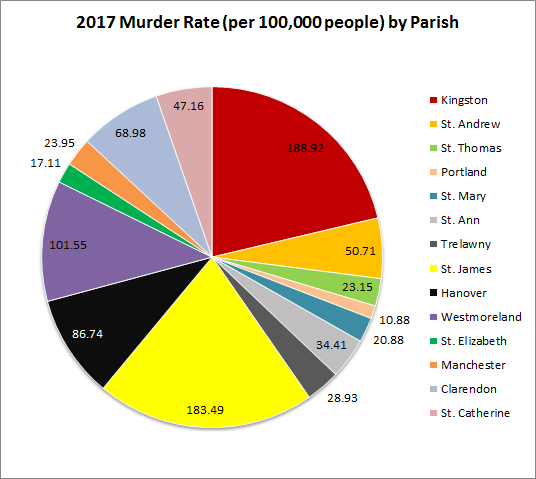 However, the murder rate dropped from 183 persons per 100,000 inhabitants in 2017 to 55 persons per 100,000 inhabitants, giving St. James the best improvement of all parishes. Meanwhile, on March 18, 2018 a State of Public Emergency was declared in specific areas of St. Catherine. The murder rate also decreased in St. Catherine, from 47 per 100,000 inhabitants in 2017 to 37 per 100,000 inhabitants in 2018, a 21% improvement. Zones of Special Operations have been ongoing in the Mount Salem community of St. James since September 1, 2017 and in the Denham Town community in Kingston since October 17, 2017. Kingston saw some “improvement” with the murder rate moving from 189 murders per 100,000 inhabitants in 2017, to 169 murders per 100,000 inhabitants in 2018, an 11% improvement. 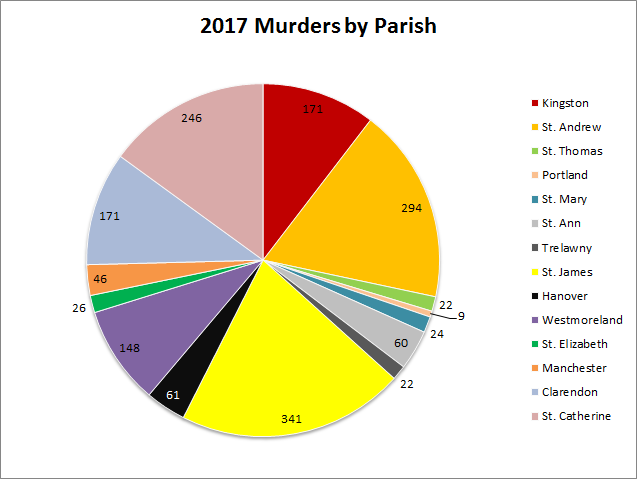 Overall, 10 parishes showed improvement, while 4 parishes had increases in the number of homicides. The parishes increasing were: St. Thomas, Portland, St. Mary and Trelawny. Hopefully, the corrective actions taken during the course of 2017 and 2018 in concert with economic growth and strengthening social safety nets will continue to bear positive fruit.